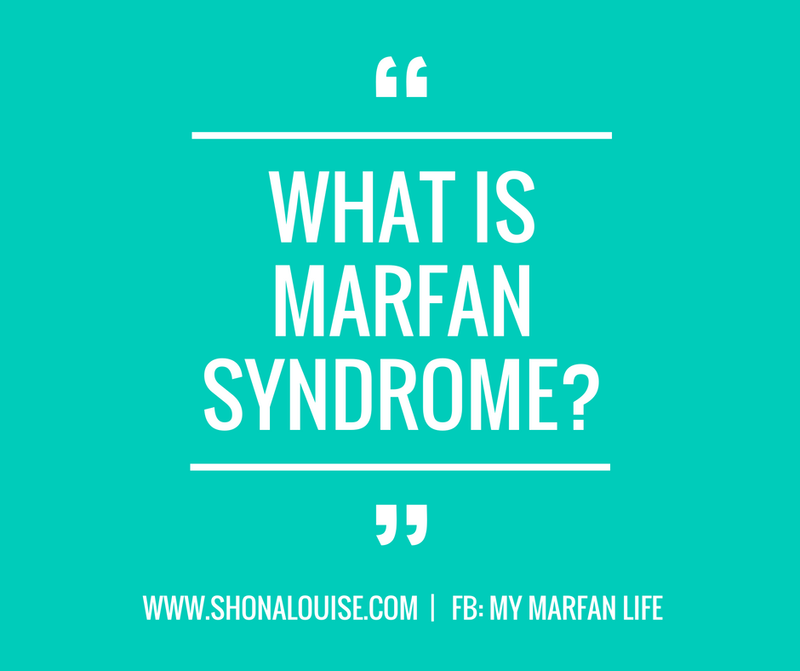 If you've clicked on this page then I'm guessing that you are probably a little curious as to what Marfan Syndrome is! And no, it doesn't involve martians. I often talk about Marfan, a genetic condition I have, on my blog and sometimes I forget that not everyone has heard me talk about it before. So, I wanted to create a solution! A page that explains the ins and outs of Marfan Syndrome alongside some information about my personal journey and awareness raising efforts. Marfan Syndrome is a genetic connective tissue disorder, think of the connective tissues in your body as the glue that holds everything together including your organs and joints. The connective tissues in the body also play an important role in helping the body grow and develop properly. So, when things go wrong with these connective tissues a lot of potential problems can arise. The condition is usually inherited from a parent, there is a 50/50 chance of the condition being passed on from an affected parent. However, in about 25% of cases spontaneous mutation occurs, this is where the gene just mutates, the condition isn't inherited. The gene defect leads to the abnormal production of a protein in our bodies called fibrillin, this results in parts of the body being able to abnormally stretch. The defective gene also leads to some bones growing longer than they should, this means that someone with Marfan may be very tall due to having long arms and legs. There is no cure for Marfan so treatment focuses on managing symptoms and reducing the risk of complications. It is a condition that affects many different parts of the body so someone with it will usually be treated by a variety of different teams and doctors including cardiologists, rheumatologists and physiotherapists. It is thought that Marfan occurs in about every 1 in 5,000- 10,000 people, making it rare condition but not majorly rare. Knowing the signs of Marfan Syndrome can honestly save lives. 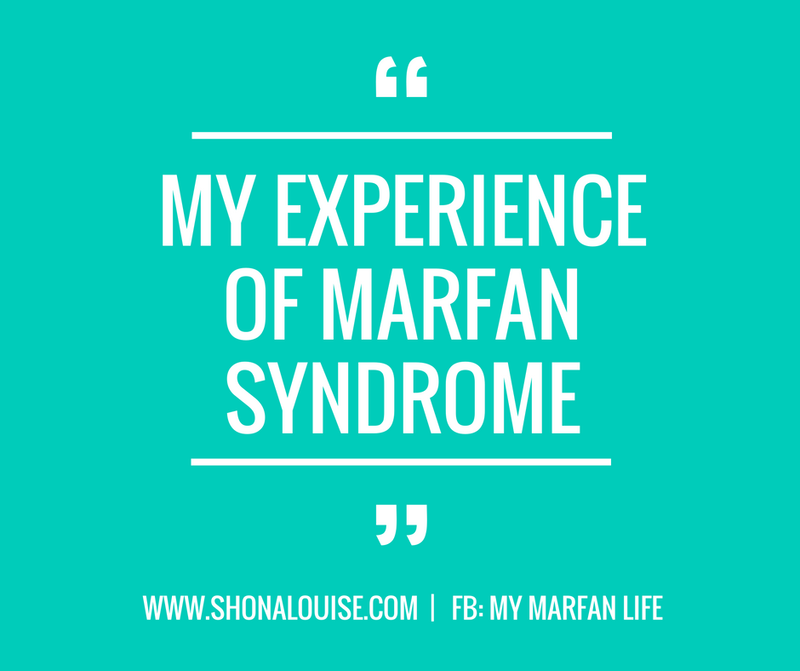 Every person's experience of Marfan is slightly different and everyone has a different combination of features. Some features are a lot easier to spot than others and unfortunately the most devastating heart complications are often the most silent problems. Having a few of the features of Marfan doesn't mean you have the condition but if you tick quite a few of the boxes then I would recommend that you speak to your general practitioner. 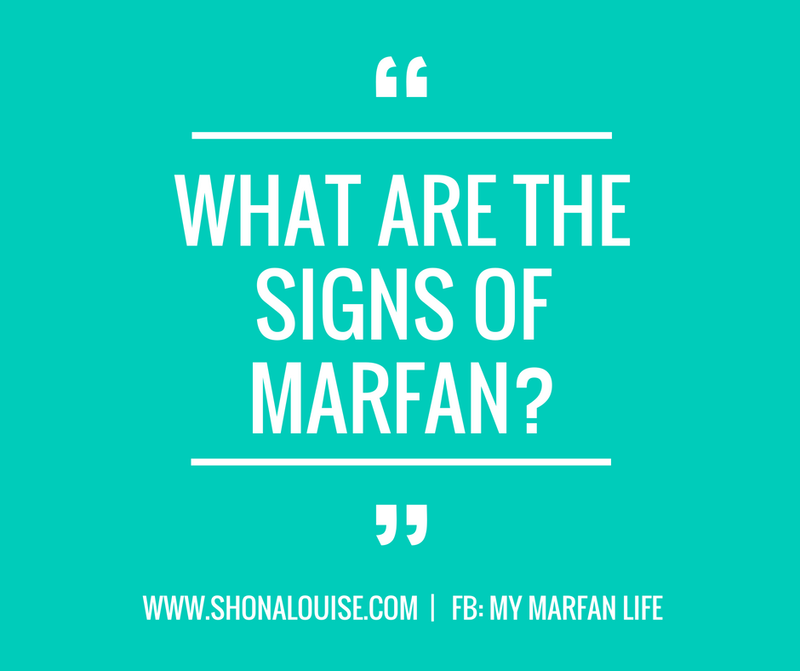 Some of the other signs are more difficult to detect though, often these are the problems that can be the most devastating so it's important to be investigated thoroughly if Marfan is detected. There are many other secondary conditions that can also arise as a result of having Marfan such as a hip deformity called protusio acetabuli, spinal cysts, early osteoarthritis and kyphosis. There are also other connective tissue disorders that can sometimes look like Marfan such as Loeys-Dietz Syndrome, Ehlers Danlos Syndrome, Familial Thoracic Aortic Aneurysm and Dissection, MASS Phenotype, Ectopia Lentis Syndrome, Beals Syndrome, Bicuspid Aortic Valve, Stickler Syndrome and Shprintzen-Goldberg Syndrome. It's important to note that not everyone with Marfan is tall and thin with hypermobile joints for example, you don't need to fit into all the boxes neatly to have this syndrome. 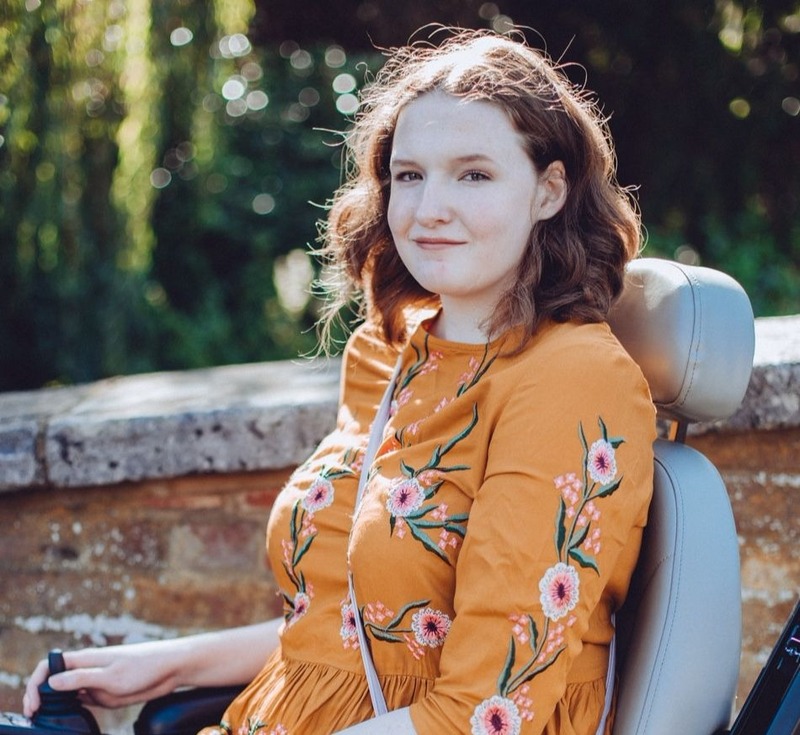 I was diagnosed with Marfan when I was just a baby/toddler, my Mum knew that she had the condition when she was pregnant with me so when they saw that I had such long arms, legs and fingers they were pretty certain that I had inherited the condition. Further tests including ultrasounds of my heart showed that my aorta was slightly more enlarged than it should be which further confirmed everyone's suspicions. As I grew up it become even more clear that I had the condition and I was almost a textbook case you could say. My long limbs, slim body, high palate, flat feet, curved spine, dilated aorta, hypermobile joints and more meant that I was often introduced to many different doctors and junior doctors, I would sit and wait as they tried to figure out what condition I had! When I hit puberty my symptoms become more life limiting though. My Scoliosis (curved spine) progressed significantly and this led to me needing to have major spinal surgery, a spinal fusion to correct my spinal deformity. This involved using metal rods and screw to straighten my spine into a better position. It was a long surgery and a painful recovery, especially since I had a complication that meant that my right leg was extremely painful every time I sat or stood. MRI and CT scans found that a screw was sitting on a nerve and a year after my first surgery I needed to have a second one to correct this by replacing the screw. The surgery was successful and the nerve pain is mostly gone, only affecting me every now and then. Soon enough though my lower back pain returned, similar to the pain I felt before my curved spine was surgically corrected. My hips also began to hurt though and after x-rays we found out that I had developed another secondary conditions thanks to Marfan. In both my hips my sockets were too dip and the femoral heads were pushing into them and my pelvis. This was eroding away both my ball and socket in both hips leaving me in a lot of pain. I had my first hip replacement when I was just 18, my right hip was totally replaced and sometime in the future my left hip will need to be replaced as well. Typically hip replacements need to be re-replaced about every 15 years so I face a lot of further replacements in the future. My hip replacement was in 2015 and unfortunately that wasn't the end of the my problems as in 2016 I was diagnosed with a tarlov cyst. This is a spinal cyst that grows out of a nerve root, anywhere along the spine, it then fills with spinal fluid. My cyst is about 5.5cm and is in my sacrum, the triangle shaped bone at the bottom of your lumbar vertebrae, the cyst has already eroded away a lot of my sacrum. The cyst causes me severe chronic pain in my lower back which is a lot worse when I'm sitting or standing. So, I use a powerchair to get around but I can't even sit up in that for long before my pain gets too severe, so I use the recline and tilt functions to relieve my pain whilst out the house. I'm currently seeing a neurosurgeon to investigate whether I have hydrocephalus and to see if surgery is an option for me, although it will be risky so even if its offered, I'm not sure what I'll do! Also in 2016 at one of my regular cardiology appointments I found out my aorta had widened further and that my aortic measurements were slowly reaching the point where surgeons would intervene. My consultant predicts I'll need major open heart surgery during my 20s, although would prefer to sort out my spine first. I've had my blog for 6 years now and over that time I slowly begun to use it more and more as a tool to raise awareness. At first I just shared my story, hoping that would help but I soon realised that to make a bigger difference I would have to make my plans bigger. I started volunteering with the HMSA (The Hypermobility Syndrome Association) a few years ago, they are a charity that supports people with any kind of hypermobility syndrome such as Marfan, EDS and OI. They didn't have a volunteer with Marfan yet and therefore they had no one representing it so I didn't hesitate to accept when I was asked to join the social media team. I was featured in one of their journals (magazines) where I shared my Marfan story and journey. I loved writing it and it showed me that it was something I wanted to do more, so now I'm their Marfan Ambassador! 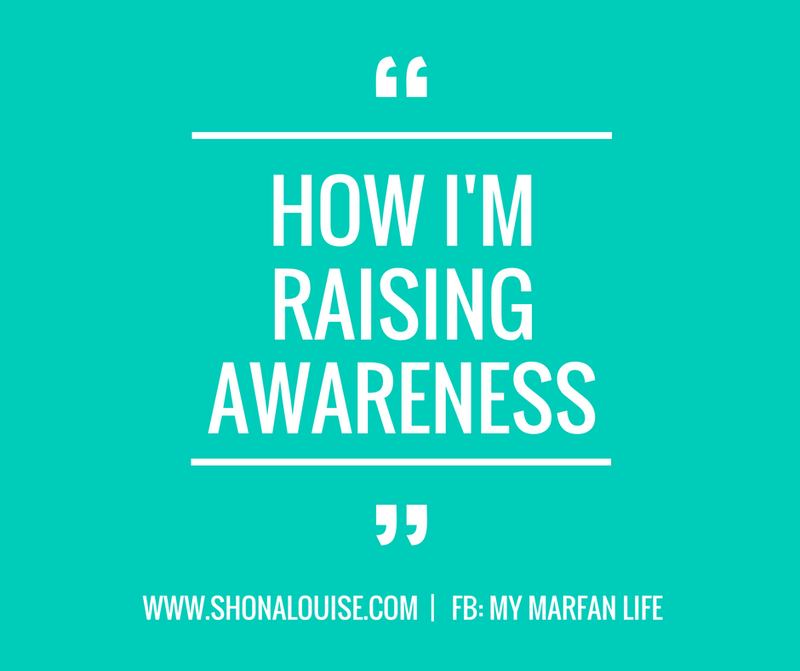 I started talking about Marfan and my story more on my blog and I jumped at any opportunity that came about. The biggest thing that I have done so far is when I worked with the British Heart Foundation in late 2016. They released some new and exciting Marfan research and they were looking for someone with Marfan to help give it a more personal aspect, I said yes straight away! I was put in the press release which led to me being quoted in a few newspapers and I even was interviewed on BBC Radio 5 Live! I was also invited to go to their head offices in London to talk at a senior managers conference about research. I spoke about Marfan, my blog and how I communicate a complex condition in such a simple way. Since then I've talked about Marfan on the radio, mentioned it in TV interviews and more! I think it's fantastic that you have taken positives out of this and used your experiences to make a difference as far as raising awareness and helping others in your position. Awesome! Just seems the natural thing to do! Such a great blog you have. I felt alone when i'm diagnosed with this syndrome. You made me feel better by sharing your experience. People says that marfan can greatly reduce lifespan. But i hope it doesn't affect our spirit! Thank you so much! The life expectancy for those with Marfan is actually very close to the average life span now, if you are diagnosed before any cardiac events!